I'm sure that most of you have seen this photo called The Falling Soldier. He was Federico Borrell García, he was shot by Nationalist soldiers while defending an artillery battery on September 5th 1936. He was identified in the photo by his brother. 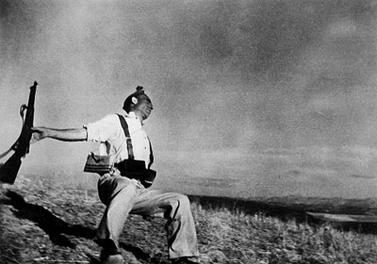 One of the most famous photographs of the Spanish Civil War. Undoubtedly one of Capa's most famous photos, ranked right up there with his photos from Omaha beach. I heard that this photo is actually fake, because it's staged. However, it's certainly true that the guy in the picture died during the Spanish Civil War. The controversy raged for years. It was only after Franco's death that the family dared to identify him, the only Republican soldier killed in that sector on that day. For half a century they kept quiet for fear of reprisal, and Capa died not knowing he'd been vindicated (he stood on a landmine in Indo-China (Vietnam) in 1951). Capa's advice to an aspiring photographer still rings true, "If your photos aren't good enough, you aren't close enough." Last edited by the ace; 06 Jan 09, 13:13. The pitcture was a fake. A few years ago they found Capas original stock camera negatives. On it the same scene was repeated several times. (Unless he was shot three times and got up every time ) I don’t remember but I think the guy died in reality later during the day. The so-called "falling soldier" was not photographed near Cerro Muriano in Andalusia, as has been claimed, but about 50km to the south-west, near the town of Espejo far from the frontline on a day when there was no military action, a Catalan newspaper claims. "Capa photographed his soldier at a location where there was no fighting," wrote the daily El Periodico on Friday. The paper carried out a detailed study of Capa's pictures taken in September 1936, three months after the conflict broke out. "The real location, some 10km from an inactive battle front, demonstrates that the death was not real," the paper says. The claim is backed with photos taken very recently on a hillside near Espejo that show a mountainous skyline that appears to match exactly that of Capa's photo. All times are GMT-5. This page was generated at 11:10.